A dull home reflects poorly on its dwellers but before you upgrade your interiors with a brand new couch, you might want to draw your attention to your walls. House paint is one of the main components that set the overall vibe in one’s home space. It can easily replace the feel of a dreary home with a more welcoming air. Thanks to the urban lifestyle, the city is backed with endless home painting services that guarantee a flawless job but often leaves you in a mess and with a hole in your pocket. 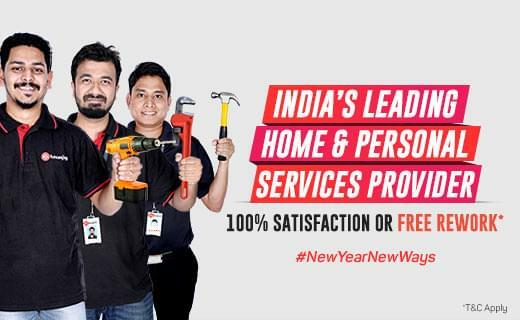 To avoid such gloomy situations, get onboard Housejoy at home services to get the best out of painting services that are both hassle free and reasonably priced. With a vetted team of professionals that carry necessary documents, tools and handyman skills, there’s no house painting service that falls short of a stellar job. Furthermore, their expertise in all round services and valuable customer insights put them at a top-notch position above other contemporaries in the painting field. So if you’re looking for a home painting service that requires interior wall painting and exterior house paint, be sure to pick our services to get end-to-end quality services from delivering superior customer support to a mess-free home after our work is done. Our unmatched home wall painting services not only get rid of the imperfections on the wall but also exude depth and texture to reflect your personality. What makes our home painting services distinct? Our professional painters are known to deliver incredible hues to complement the overall tone of one’s home. Aspiring to promote serenity, trust and beauty, our verified list of painters understand the psychology behind colour shades and can easily recommend the most apt tone for your home interior painting. For instance, soft and pastel shades are best suited for bedrooms while bold colours are best for the living room. To book an appointment with Housejoy, you need to share the details of the kind of painting service that is required, schedule a time interval with our experts and sit back and enjoy. On confirmation, the house painting services team will then come and inspect the areas and provide you with details on which paint is the best for your home and what kind of sheen (matt, gloss) it requires. Lastly, HouseJoy's painting services are undertaken by trained & certified professionals, who offer hassle free services while accentuating the charm of your walls.